Arian Foster is mystifying even his teammates with his newly-adopted bowing-in-the-end zone act. "I don't know if it's from the Chinese or the Egyptians," Texans fullback Vonta Leach said. Actually, it's derived from Hindu or Indian and Nepal origins. It's something the second-year undrafted running back out of Tennessee, relegated to the practice squad most of last year, came up with in the off-season. "I feel like every running back should have their own little stamp on the game," said Foster, whose troubled adolescent days shifted from Albuquerque to San Diego before an up-and-down college career at Tennessee. 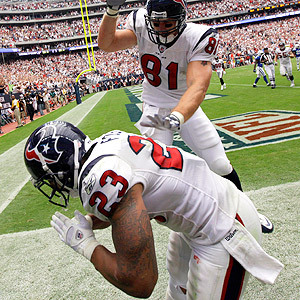 AP Photo/David J. Phillip Texans running back Arian Foster bows to the crowd as Owen Daniels celebrates. "Mine stems from the core or what I believe," he said. "It's a Namaste. It means respect. It just means, 'I see the God in you.' It's me paying my respect to the game of football." A philosophy major in college, Foster learned respect quickly last year. That was evident the first few days of training camp when, despite his purposeful running, position coach Chick Harris didn't give him much of a chance. After Houston's running game muddled throughout the season, Foster was pressed into action in the last two games when he ran for 216 yards and three touchdowns. This year, he bowed to the football world in a big way after busting out for a franchise-record 231 yards and three TDs in a season-opening win over the Colts. After each touchdown, he paid his respects with a bow. "I studied Buddhism for a while," said Foster, who is not Hindu. "I'm really into different types of cultures and religions. I really like their belief system, and I just believe we're kind of all in this together as people, energies and life forces." Whatever the origin, the bowing act in which he clasps both hands together and leans forward has him looking like he's seeing King Tut. His teammates don't care. They're just happy with the end result. "That's what we're about -- getting the skill guys' names in the paper," Texans offensive tackle Eric Winston said. Take that as a Namaste from the big boys up front. That's somewhat ironic, considering last year Foster was the one getting glaring looks from teammates in the early going. Now, following a year in which he was mired by the arrogant label he wore in Knoxville, it's almost as if the Texans are bowing to him. "Well, he's grown up a lot," Texans coach Gary Kubiak said. "Like I told y'all, he's come a long ways as a player." His father, Carl Foster, who played at New Mexico before an unsuccessful tryout with the Denver Broncos, and mother Bernadette Sizemore named their son with intellectual intentions in mind. Arian means, "water bearer, holder of knowledge." But Foster's fascination with the "out there" way of life didn't come overnight. "I'm guessing it's just in me," he said. "It's in my innate nature to gravitate towards that. I just always have been very comfortable with [the Buddhist] culture and their belief system. I don't know why you wouldn't want to treat anyone like you would want to be treated." "Everybody's got their own celebration," Leach said. "I don't know what it is." Maybe Foster is the new King Tut on turf. Jim McCurdy is a freelance writer for Sports Media Exchange, a national freelance writing network.